Central place theory may work quite well in Mexico in terms of the relative numbers of settlements of different size, but the theory also suggests that those places on the same level of the urban hierarchy should form a distinctive spatial pattern and be roughly equidistant from one another. In essence, this means that each of these central places will be at the center of an approximately equally sized market area, or sphere of influence, well positioned to serve everyone who lives within its limits. The map shows the settlements in the western part of the state of Michoacán. 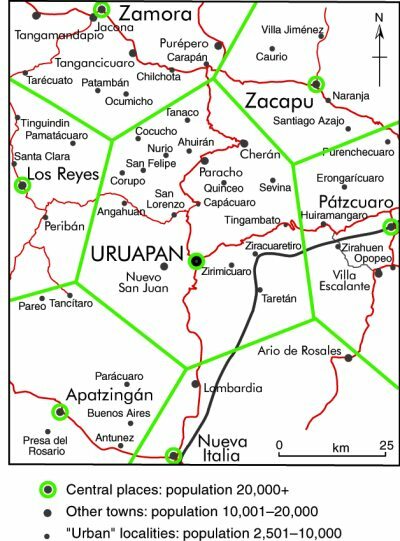 The largest city by far is Uruapan (250,000 inhabitants in 2008). Around Uruapan are six fairly large neighboring towns or cities. Each of these settlements has its own corresponding market area. However, even though these six places are roughly equidistant from Uruapan, they turn out to be very different in size. For example, Zamora (240,000) has more than four times the population of Pátzcuaro (53,000). Zamora is bigger because in addition to providing services to a larger, more prosperous, surrounding market area, it also has some manufacturing and is on a railroad line and the original highway between Mexico City and Guadalajara. In addition, there is no observable regularity in the pattern of settlements of the two smaller sizes—“other towns” and “urban localities”—shown on the map. This is clearly in contradiction to central place theory, but should not really be a surprise. The theory assumes, for the sake of simplicity, that large areas will not have any significant differences in relief or soil fertility and that transport costs will be directly proportional to distance. It also assumes that rural areas have equal population densities and that their residents have similar consumer tastes and purchasing power. In practice, these assumptions are not valid, and some of the anomalies in the pattern of settlements shown on the map can be easily explained. For instance, the areas immediately north of Apatzingán and east of Nueva Italia are very mountainous, far less favorable for farming and settlement than the area north of Uruapan. The very idea that settlements will be equidistant from one another begs a very important question, pertinent to our earlier discussion of the categories of rural settlements. Should we measure distance only in a spatial sense, in kilometers, or might it be more worthwhile to consider it in terms of the time or monetary cost required to make a particular journey, taking into account the terrain and transportation network? In summary, central place theory does a good job of explaining the number of central places at each level and the types of services they provide. At the same time, departures from the idealized shape and size of market areas predicted by the theory help to reveal the complexities of Mexico’s physical, human and socio-economic geography.